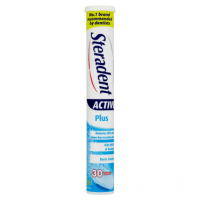 You can do more to help protect your remaining natural teeth by following a good oral care routine every day. Using Poligrip for Partials can help. 1. Brush your natural teeth twice daily with a fluoride toothpaste. 2. Clean your partial denture daily with Poligrip for Partials Clean & Protect cleanser tablets. 3. 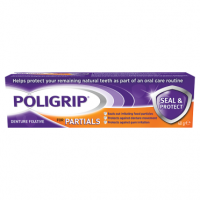 Use Poligrip for Partials Seal & Protect fixative to help stabilise your partial denture. 4. Regularly visit the dentist (every 6 months). 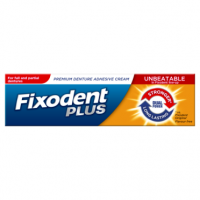 1 Drop one Poligrip cleanser tablet into enough very warm (not hot) water to cover the partial denture. 2 After soaking for 3-5 minutes, for best results, brush the partial denture with the solution using a soft brush. 3 Rinse the partial denture thoroughly with running water. Discard remaining solution immediately after use. 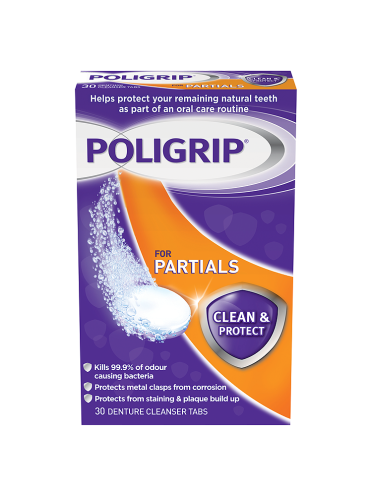 Poligrip for Partials Clean & Protect with active oxygen kills 99.9% of odour causing bacteria, helps reduce plaque and protects metal clasps from corrosion. 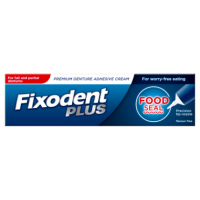 Use as part of a daily oral care regime to help protect your remaining natural teeth. Do not touch mouth or eyes after handling tablets or solution. Do not use if your are sensitive to any of the ingredients. Do not place tablets or solution in mouth. Harmful if swallowed. Causes serious eye irritation. May produce an allergic reaction. Wash hands thoroughly after handling. If in Eyes: Rinse cautiously with water for several minutes. If eye irritation persists: Get medical advice/attention. Keep out of reach of children and those at risk of accidentally swallowing the tablet or solution. If swallowed: Call a Poison Center or doctor/physician. If irritation occurs: Discontinue use and get medical advice/attention. Keep tablets in a cool dry place.